The best worms for composting are red worms. 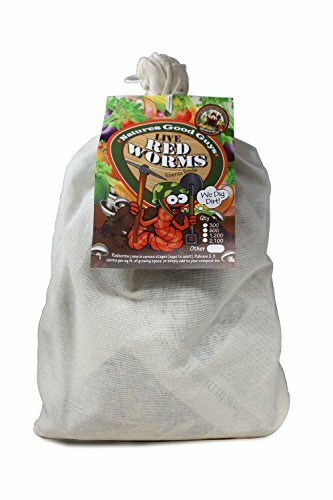 Redworms will aggressively feed and reproduce in typical compost and garden conditions, leaving their castings as food for your plants! For compost bins: Add 600 of red worms to your bin, and feed regularly. Red worms love cardboard and paper. A layer of moistened cardboard or newspaper on top of your compost will bring the worms to the feeding areas where you add new waste. Simply pull up the cardboard or paper and drop the waste materials in. Worms do not like meat, but flies do! So keep your compost vegetarian: fruit, vegetable, and garden waste, along with non-glossy paper. Make sure that indoor compost bins are well drained. Any juices that drain out of your compost bin are called "compost tea," and can be used as a potent fertilizer for outdoor plants. Garden Areas: Dig 6 inch diameter, 1 foot deep holes several feet apart though out the garden. Fill with water and let drain. Put one or two handfuls of worms in each hole, fill loosely with soil and compost (cuttings, table scraps, etc.) This will give the worms a quick meal. Water the area and apply mulch if possible over and around the holes. Keep the area watered. Compost Pile: Place worms on the bottom of 4 inches of loose soil. Keep damp as you continue to add decaying organic material. What to Feed Your Worms: Fruit: apples, pears, banana peels, strawberries, peaches and all melons Vegetables: beans, cabbage, celery, carrots, cucumbers, tomatoes, all greens, corn, corncobs and squash Cereals and grains: oatmeal, pasta, rice, non-sugared breakfast cereals, corn meal, pancakes Miscellaneous: coffee filter paper, tea bags, eggshells, dead flowers Other food/bedding: newspaper (no shiny or coated paper), cardboard, paperboard, paper egg cartons, brown leaves Do Not Feed: Non-biodegradable materials, plastic, rubber bands, sponges, aluminum foil, glass, & pet feces. Go Green! !